Margaret will of course tell you all the “news” more fully than I can possibly write it; but I must write too to say how very sorry I am at my failure to get a glimpse of you on Saturday. I had no idea that I would be “met” if I took the late train or that I would find even a cab at the Station, and you know I am an abject coward about being out alone at night. I feel very penitent about giving the dear Hoyts so much trouble for nothing. 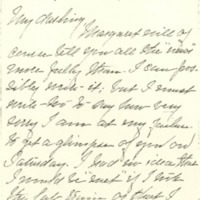 Wilson, Ellen Axson, “Ellen Axson Wilson to Jessie Woodrow Wilson Sayre,” 1908 February 19, WWP17431, Jessie Wilson Sayre Correspondence, Woodrow Wilson Presidential Library & Museum, Staunton, Virginia.